As the death toll continues to rise in Mexico’s drug war, now claiming more than 35,000 lives since President Felipe Calderón took office in December 2006, fewer than half (45%) of Mexicans say their government is making progress in its campaign against drug cartels; 29% say the government is losing ground and 25% say things are about the same as they have been in the past. Still, an overwhelming majority (83%) continues to endorse the use of the Mexican army to fight drug traffickers, virtually unchanged in recent years. Moreover, many welcome U.S. help in training Mexican police and military personnel (74%) and providing money and weapons to Mexican police and military forces (64%). And while Mexicans broadly oppose the deployment of U.S. troops to combat drug traffickers in Mexico (38% support and 57% oppose), more now support this strategy than did so in 2010, when only about a quarter (26%) favored the deployment of U.S. troops in their country and two-thirds opposed it. 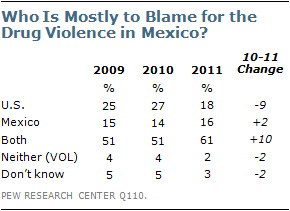 The survey of Mexico conducted by the Pew Research Center’s Global Attitudes Project between March 22 and April 7 also finds that illegal drugs and cartel-related violence rank among the top national problems facing Mexico; 71% say illegal drugs are a very big problem in their country and even more (77%) see the violence associated with drug cartels as a major challenge. Concerns about illegal drugs and cartel-related violence are especially widespread in the North, where Mexico’s cartels have been especially active. Nearly nine-in-ten (87%) in North Mexico say illegal drugs are a very big problem in their country, compared with 69% in the South and in the Greater Mexico City area and 63% in Central Mexico. Similarly, 94% in the North see the violence associated with drug cartels as a very big problem; 75% in Mexico City, 73% in the South and 69% in Central Mexico share this concern. When asked who is most to blame for the drug violence in their country, more now say both Mexico and the U.S. are to blame than did so in recent surveys. 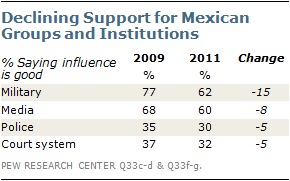 About six-in-ten (61%) Mexicans blame both nations; 51% held this view in 2009 and 2010. Currently, 18% say the U.S. is mostly to blame and about the same percentage (16%) blame Mexico; a year ago, nearly twice as many said the U.S. was mostly to blame as named Mexico (27% vs. 14%). The image of the U.S. has rebounded somewhat since the passage of Arizona’s controversial immigration bill in April 2010, but it remains far more negative than it was prior to the law’s enactment. Currently, a slim majority (52%) of Mexicans hold a favorable view of the U.S., while 41% express a negative opinion. A year ago, 56% had a favorable view of the U.S., but those who were interviewed before Gov. Jan Brewer signed the Arizona measure into law on April 23, 2010, offered far more positive opinions than those interviewed following the law’s enactment; 62% of those interviewed April 14-20, 2010 rated the U.S. favorably, compared with just 44% of those interviewed May 1-6, 2010. 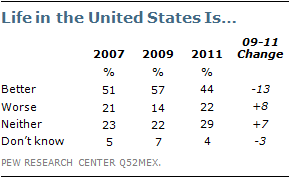 In 2009, nearly seven-in-ten Mexicans (69%) expressed a positive attitude toward the U.S. Fewer See a Better Life in U.S.
Mexicans are less likely than they were two years ago to say that people from their country who move to the U.S. have a better life than those who stay in Mexico. Fewer than half (44%) now say this is the case; 22% say life is worse in the U.S. and 29% say it is neither better nor worse. In 2009, nearly six-in-ten (57%) said people who moved to the U.S. from Mexico enjoyed a better life in the host country, while 14% believe life was worse for those who moved to the U.S. and 22% said it was neither better nor worse. Younger respondents are more likely than older ones to say they would move to the U.S. Slightly more than half (52%) of those younger than age 30 say they would move if they had the means and opportunity to do so, including 28% who say they would be inclined to work and live in the U.S. without authorization. 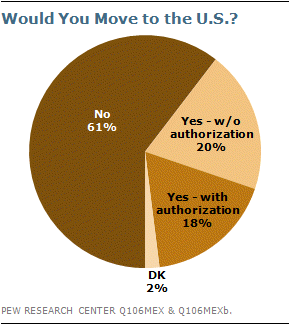 In contrast, just 36% of those ages 30 to 49 and 27% of those 50 and older say they would move to the U.S. (20% and 11%, respectively, say they would do so without authorization). After shrinking in 2009, during the global recession, Mexico’s economy rebounded impressively in 2010 – growing at its fastest rate in a decade. Still, an overwhelming majority of Mexicans remain dissatisfied with economic conditions and with their nation’s direction overall. Roughly three-quarters (76%) say they are unhappy with the way things are going in their country, little changed from assessments in 2009 and 2010. Dissatisfaction with the country’s direction is common across the different regions of Mexico and cuts across income and educational levels. Discontent with current economic conditions is similarly widespread with about two-thirds (68%) describing the economy as poor, down slightly from 75% in 2010; just 30% say the economic situation in Mexico is good. 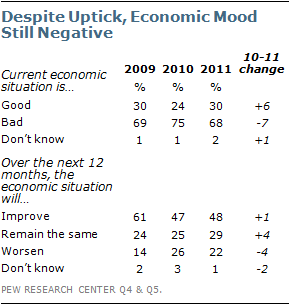 Looking ahead, Mexicans are no more optimistic than they were a year ago about their country’s economic prospects. Roughly half (48%) believe the economy will improve over the next 12 months, while 29% think it will remain the same and 22% say it will worsen, virtually unchanged from 2010. In 2009, however, as the effects of the global recession and the faltering U.S. economy were beginning to be felt, Mexicans were actually more optimistic, with 61% saying economic conditions would improve in the coming year. As noted earlier, among the challenges confronting their country, Mexicans most frequently name crime (80%) and cartel-related violence (77%) as very big problems. Roughly seven-in-ten (71%) see illegal drugs in the same light. 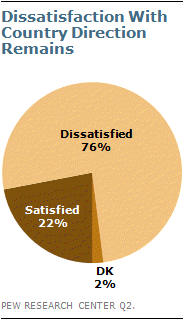 Most (69%) also describe economic problems as a major challenge. Indeed, when asked specifically about rising prices and lack of job opportunities, majorities (74% and 70%, respectively) say these are very big problems in Mexico today. Slightly smaller numbers place corruption (65%) and terrorism (62%) in this category, while fewer than six-in-ten (56%) characterize pollution as a very big problem. Just half say people leaving the country for jobs elsewhere is a major issue. While crime and cartel-related violence rate as major challenges among all Mexicans, those with lower incomes are especially concerned about terrorism, with more than seven-in-ten (73%) among this group describing terrorism as a very big problem.1 Only 54% of middle-income and 49% of higher-income Mexicans see terrorism in the same light. Despite the economy not topping the public’s list of major challenges, when asked separately about rising prices and lack of job opportunities, strong majorities (74% and 70%, respectively) say these are very big problems in Mexico today. Not surprisingly, given the high levels of concern about crime and cartel-related violence, Mexicans by a 58%-to-26% margin say it is more important for the government to try to maintain law and order than to protect people’s personal freedoms. About one-in-seven (15%) volunteer that the government should give equal weight to both. Compared with two years ago, the number of Mexicans who think personal freedoms should take precedent over law and order has increased eight percentage points, rising from 18% in spring 2009. Supporters of President Calderón’s PAN tend to be more insistent that law and order should be the government’s top priority. Roughly seven-in-ten (71%) PAN supporters say it is more important for the authorities to maintain law and order than to protect personal freedoms; only 52% of those who back the opposition PRI agree with this view. Despite overwhelming concerns about crime and drug-related violence and negative assessments of the country’s economy and overall direction, most Mexicans continue to say that President Calderón and the national government are having a positive impact on the country. Nearly six-in-ten (57%) say the president’s influence is good, while 39% describe it as bad; 54% give the national government a positive rating, while 41% say the government is having a negative influence. 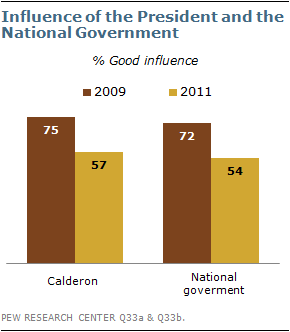 Compared with two years ago, however, views of Calderón and the government have become increasingly negative. In 2009, three-quarters said Calderón was having a positive influence and 72% said the same about the national government; just 22% and 26% gave the president and the government, respectively, a negative rating. Views of the national government are tied, at least in part, to opinions about the government’s handling of drug traffickers; a solid majority (63%) of those saying the Mexican government is making progress against drug traffickers describe the national government’s influence as good, compared with 47% of those who say the government is losing ground and 46% of those who say things are about the same as they have been in the past. 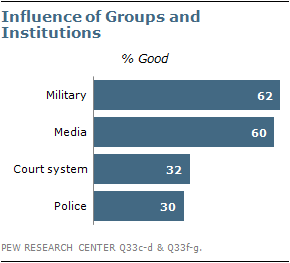 Most Mexicans say the military and the media are having a very or somewhat good influence on the way things are going in Mexico (62% and 60%, respectively) In contrast, only about three-in-ten say the court system (32%) and the police (30%) are having a positive influence. While the military remains popular, the percentage saying it is having a good influence has declined by double digits, from 77% in 2009. Ratings for the media have also declined over the last two years, though not as dramatically; 68% said the media was having a good influence on the way things were going in Mexico in 2009. In 2002, when the question was first asked, 84% of Mexicans saw the media’s influence as positive. A slim majority (55%) of Mexicans have a favorable opinion of President Felipe Calderón, while 42% express an unfavorable opinion; in 2009, about two-thirds (68%) had a positive view of the president. Gustavo Madero Muñoz, the president of Calderón’s PAN party, receives negative ratings on balance, with nearly four-in-ten (39%) expressing an unfavorable opinion, 18% voicing a favorable opinion and 43% of respondents not offering an opinion of the current president of the PAN party. 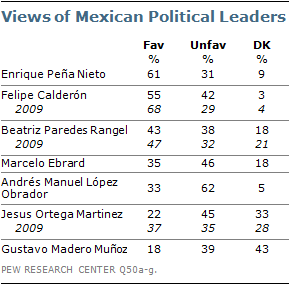 Enrique Peña Nieto, current governor of the State of Mexico and potential presidential candidate for the PRI, is viewed favorably by about six-in-ten (61%) Mexicans, while only 31% express an unfavorable view of him. Majorities across all demographic groups offer a positive opinion, with especially high ratings among those who identify with the PRI (80% favorable). Beatriz Paredes Rangel, former president of the PRI, receives more mixed ratings; 43% of Mexicans voice a favorable opinion of her and 38% offer an unfavorable view. Marcelo Ebrard, current mayor of Mexico City and a member of the Party of the Democratic Revolution (PRD), is seen favorably by 35% of Mexicans, while nearly half (46%) have an unfavorable view of him. Ebrard is viewed most warmly by residents of Mexico City; 56% have a favorable view, compared with about three-in-ten in North (32%) and Central (31%) Mexico and 26% in the South. Fellow PRD member Andrés Manuel López Obrador has the highest unfavorable ratings of the politicians tested, with over six-in-ten (62%) voicing an unfavorable opinion of the 2006 presidential election runner-up and one-third expressing a positive view. Views of Jesus Ortega Martinez, president of the PRD, are also negative, on balance (22% favorable vs. 45% unfavorable); one-third of Mexicans do not offer an opinion. Favorable ratings for Martinez have declined 15 percentage points since 2009, when nearly four-in-ten (37%) Mexicans offered a favorable view of the PRD leader.